Thanks to Old El Paso and My Blog Spark, my family enjoyed our ground beef seasoned with a packet of Old El Paso Taco Seasoning, a Cactus Chip & Dip Serving dish, a set of 3 Fiesta Chili Pepper serving dishes and a $10 gift card to purchase our favorite taco fixings of lettuce, tomatoes, cheese sour cream and salsa. Old El Paso has also created a Family Taco Dinner Night at El Tacodor that includes games, trivia and family challenges to make taco night a lot more fun and enjoyable. 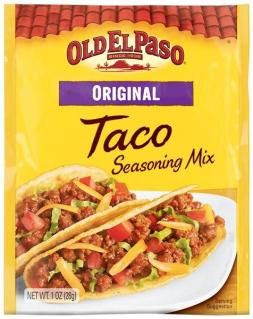 Make Family Taco Night even more affordable by downloading a printable coupon for $0.60 off any two Old El Paso products (if your store doubles coupons, you might get your taco seasoning packets almost free!). ~Prize: An Old El Paso Prize Pack! One reader will win an Old El Paso “Family Taco Night” prize pack: a packet of Old El Paso Taco Seasoning, a Cactus Chip/Dip Serving dish, a set of 3 Fiesta Chili Pepper serving dishes and a $10 gift card to purchase taco fixings! Mandatory entry: Share how you plan to make “Family Taco Night” a special occasion OR which night of the week would you designate as “Family Taco Night"
Oh, I follow you all over the place already! Dang it! Okay, but if we were to win, and i really, really, REALLY hope that we do, I would say that Friday night would be our "Family Taco Night" because it is the one night of the week where we can all relax and not have anyplace to go and no homework so we could sit around the table and enjoy the feast. My kids have always loved a good taco night and I would love to have ours be a little more festive than what it is now! I would make Monday night Taco and movie night. Friday night would be great for “Family Taco Night"
I would designate Sunday as taco night. I follow you on networked blogs- Mary Happymommy. I now follow you on Networked Blogs. I would designate thursday as taco night. That stuff is just too cute. bI would love to win it. I would make taco night special by tossing Hubs out on his ear first, as he hates Mexican food. then, the children and I would have a lovely evening. I blogged about the giveaway to my readers. I would add this to our Mexican restaurant! And I even stalk you on facebook! Family taco night is going to be monday- since its easy to make and mondays are hard b/c its a new week. Hubby and I have taco nights on a week night, almost weekly. It is super quick and super delish! Pick me Pick me!! We have tacos often and to make it more fun we make our own with lots of different toppings!!! I entered the Butter Bell Crock giveaway. I would designate Tuesday as "Family Taco Night" :) *Thanks* for the giveaway! Definitely Friday. I need something easy by then. saturday night is our Family Taco Night! no after school events to attend, makes it easier for everyone to be together. we have tuesday night as taco night here...quick and easy. Those dishes are cute, sign me up. I signed up to follow you thu networked blogs as well. I entered your Butter Bell giveaway too. Wednesday is Taco night for us. I entered the butter crock giveaway.